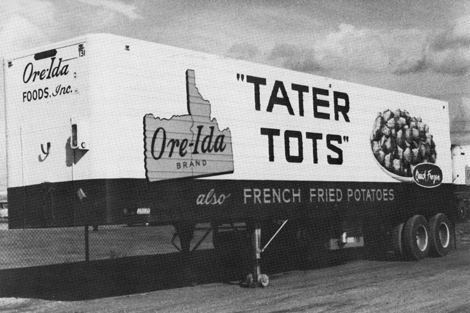 While I was researching Tater Tots last week, the internet told me that tots were hard to make and that even high-end restaurants often opted for the original Ore-Ida rather than making their own. I could have spent my day applying for internships or catching up on political science reading, but instead, I spent like, 3 hours in the residence hall kitchen proving the internet right. Tots take forever to make, and the results are, in a word, disappointing. In three words: blobby hash browns. My tots didn't taste bad necessarily, but they weren't great. And they definitely did not meet the Tater Tot standard. I didn't have access to a grater or a food processor, so I had to do the grating haphazardly with a knife, which definitely added to prep time. The biggest problem was that they started coming apart in the oven when I need to flip them over. All of a sudden, I went from nice cylinder-shaped tots to a lump of hash browns. And even though some kind of retained their form, they didn't have the crunchy outside and soft inside we've come to expect. They also didn't look anything like the photo on the recipe site. Save yourself the trouble. Buy a bag of the frozen stuff.